One of the first things we notice when we meet someone is their smile and their teeth. And that’s why Lose it with Laser brings you the best Teeth Whitening services. If you have yellow teeth and want to brighten or whiten your teeth, then we’ve got you covered. Now you can get the confidence of a whiter and brighter smile without the expense of a visit to the dentist. At Lose it with Laser, we use both non-abrasive gel that does not contain hydrogen peroxide and also offer a 10% or 25% strength hydrogen peroxide for those who want to get whiter teeth, quicker. The cold light technology of the LED lamp that we use at our teeth whitening clinic in Melbourne, unlike the UV lamps used by other salons, ensures there is no damage to the tooth’s enamel. With us, you can achieve outstanding results without compromising the health of your teeth. We ensure you that our teeth whitening Melbourne services get your teeth whitened and give a new look to your smile and face. Keeping in mind that you can only whiten your teeth to a shade as light as you are genetically predisposed to be, you can repeat the treatment multiple times. In just 20 minutes, you will achieve obvious lightening and brightening of the teeth. Also available to purchase after your treatment are take-home LED teeth whitening kits so that you can further enhance or maintain your great new smile! 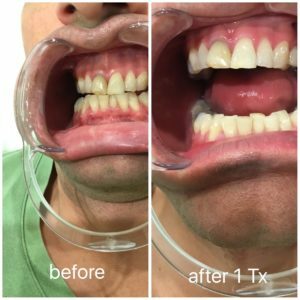 Looking for great teeth whitening service in Melbourne? Contact Lose It With Laser today on 0432 162 862 today to book an appointment with us.